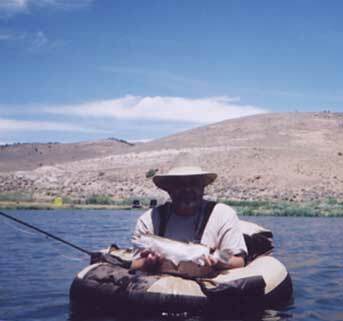 Smith Creek Ranch is located approximately seventy-five miles from Fallon, Nevada, in a small canyon off a dry lake. Looking at the ranch, you wouldn' t realize that trout the length of your arm to the elbow and beyond are cruising the depths of a man made pond within easy walk of the ranch house. It is the realization of a dream of Verle Hendrix, patriarch of the Hendrix family. The fish are raised from the egg to three pounds in a stream above the pond and dumped in the pond at three pounds. The trip was formulated at the San Rafael Fly Fishing show in March. 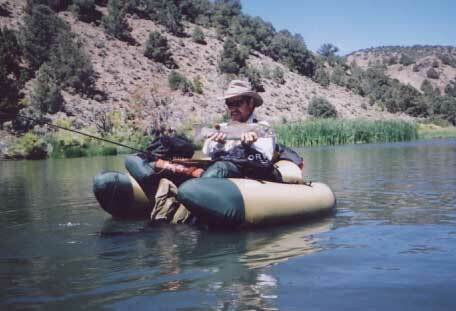 The reason being that the ranch is now managed as a private-water fishery by the Reno Fly Shop. It is they you have to call to reserve time on the water, book the ranch house for a couple of days, and decide on the type of package deal that best suits your party. Since it was going to be a type of celebration, I wanted the full treatment. I asked who the cook would be and Rob from the fly shop said I could probably get Annie and Ron. Annie had been out on the ranch cooking for the Hendrix' s for a summer a couple years ago so I knew the food would be good and wholesome. I asked to set it up. Four days and three nights with cook (anyone needing Ann and Ron's address and e-mail can contact me at home) and all the fishing a person could take in. The nice thing about the fly shop running things is that now fishing can commence after you arrive instead of you being charged for the whole day and you can fish on Sundays now, too. That was always a problem in the past because the family always went to Fallon on Saturday night for groceries and to go to church Sunday morning, so fishing had to end Saturday. Guests had to leave the ranch by mid- to late-Saturday and could stop in Fallon, Reno, or go all the way home before the weekend was over. Phil Drees was the first to tag a fish this trip, In fact, the first four of the trip were his. All about twenty inches in length and harder than most to bring to the net. Phil wet waded that first afternoon, though I think just about everyone wet waded sometime during the fishing. The pond is constructed so you can wade in or launch float tubes in shallow water, then float to deeper water close by. Cruising fish abound in the nearly crystal clear water, so most of the fishing is for sighted fish, but one can rig for underwater fishing as well. The big browns usually don' t come up till late in the evening, so the best way to catch them earlier is go to the bottom with a nymph. Not to forget all the others who fished: Bobbie and Wayne working the grass on the southern side of the pond connected with fish the first afternoon; Les and JC had to wait for the second day to hook and release fish; Wayne had a fish on the last day that was pretty big, but everyone else was off the water by that time so there were no pictures just a fisherman's yarn. Of course you could go there and find out for yourself how big that fish was. Most of the fish were in the twenty to twenty-four inch range. The fish were all weighty with nice girths and lots of fight. Some fish were lost to bent hooks and slack lines, but not broken tippets. No leader shy fish there. Were I to go again this year I would wait for September when the temperatures are milder. The trout are hungry all the time. If it isn't damsels, then it might be hoppers or some other large insect or, like trout the world over, the favorite caddis pattern might bring a prize photo subject to your net. Call the Reno Fly Shop for reservations. Tell them JC sent you. You now need to bring your own bedding to the ranch: either sheets and blankets or a sleeping bag. It is a primitive place now that it is a private-water fishery. Don't forget a towel or two, too. Pictures speak louder than words and just ask those guys if they would like to go back. Not much out there in the desert but sagebrush, a few cows, and some gosh-large trout. Have a safe trip and keep a tight loop 'till next we meet.